It’s almost August and pretty soon all the kiddies will be returning to school. 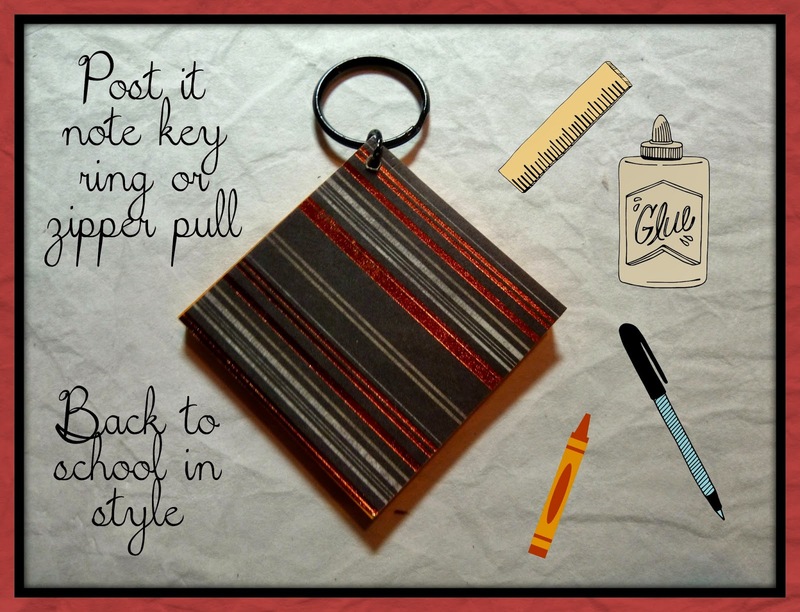 This little post it note is a handy little key ring or maybe even a zipper pull. Need to jot down a quick note, assignment or phone number? Just pull a sheet off for a sticky note. It’s always at hand just when you need it. It’s easy to make it just a few minutes and you can even personalize the cover depending upon which scrapbook papers you use. 1. Cut a piece of cardstock scrapbook paper 2” x 2.” Pull off a chunk of post it notes to the thickness of just under ¼” thick. Place the cardstock on top of the post it notes using the sticky surface to hold it on. 2. Take the entire piece to an area where you can drill without damaging your surface. I use a few sheets of heavy corrugated cardboard. Drill in the corner with the sticky area going down the left side, sort of a diamond shape. Make sure if you hold that corner that the pages are free. 3. Use the awl to make sure the drill has made a hole that goes through the entire pad and to clear out any drill shavings. 4. Use the needle nosed pliers to twist open a heavy jump ring. (Twist rather than pull open) Thread through the hole and twist to close. 5. Add a split key ring. This looks really great! I alway needs a notepad nearby.